Each year up to 35 children and around 10 adults receive an implant at Beaumont Hospital. It brings the gift of hearing and, particularly for young children, the opportunity to develop normal speech. In a person with normal hearing, sound waves make the eardrum and three little bones in the middle ear vibrate. These vibrations are transmitted to the inner ear, or cochlea, where they stimulate thousands of tiny hair cells which in turn send electrical messages to the brain via the auditory nerve. Many people with impaired hearing can be helped surgically or with hearing aids but in more severe cases a cochlear implant may provide the solution. This picks up and converts sound into an electrical message which is transmitted directly to the auditory nerve, bypassing the damaged or absent hair cells of the inner ear. 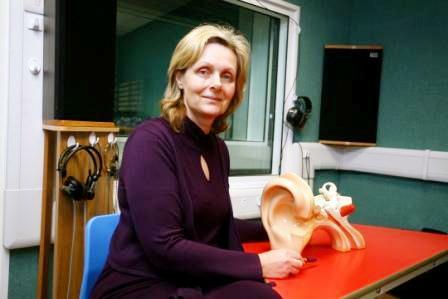 Even profoundly deaf people may be helped in this way. Implantation is irreversible, so careful assessment is needed to determine the suitability of a patient. This often takes up to six months and the entire process up to a year. For many people, hearing loss is a progressive condition. Some people on the programme, therefore, are regularly assessed over many years and only receive an implant when it becomes necessary. During the operation, which takes up to three hours, the internal parts of the implant are inserted underneath the skin. The receiver/stimulator sits just behind the ear and the electrode array is coiled around the cochlea. Patients usually spend five to seven days in hospital and children are usually back at school and adults at work after 2-3 weeks. After surgery there is a gap of up to six weeks to allow any swelling or tenderness around the implant site to subside. Then the external parts of the device are fitted and the device is switched on for the first time. Following this comes the process of programming the implant and therapy. Since the programme was started by ENT surgeon Laura Viani 14 years ago, the implant team has developed considerable expertise in hearing assessment. It operates an "open door" policy as a national tertiary hearing assessment centre, so patients may be referred by specialists, GPs or even refer themselves. The team sees over 100 children a year. and outer ear used to explain to patients how implants work. Senior Speech and Language Therapist Jennifer Robertson, who works mainly with children, has been with the programme since the very beginning in 1993. She points out that early implantation has well proven benefits for a child, both in terms of communication and social and educational development. There is a good postoperative outcome for children under five, but an even better one for children under three, she says. For this reason, the primary focus of the programme is on children. But Laura Viani is conscious of the need to help as many adults as possible, too. With each implantation costing around €50,000 the challenge is to do as much as possible, as equitably as possible, within the financial constraints. The fact that this is a 100% public programme, she says, and that she undertakes no private practice herself, has strengthened her position when trying to secure State funding over the years. The large team currently includes one surgeon, audiological scientists, speech & language therapists, specialist teachers and administrative support. In addition, the programme is supported by other experts, including radiologists, anaesthetists and psychologists as well as the sisters and nurses in St. Raphael's Ward.